Sir Alex Ferguson has backed The Boys’ Brigade ahead of its latest recruitment drive in a bid to welcome a new wave of children and young people to its 430 groups across Scotland. The football legend has spoken of his own time in the organisation when he was a member of the 129th Glasgow Company and how the experience helped gear him up for success. His comments come ahead of the new BB campaign, One For All, which aims to support companies and battalions in setting new challenges and welcoming new members. The BB wants each section, including Anchor, Junior, Company and Senior, to take part in the campaign to grow their membership by at least one member compared to this time last session. 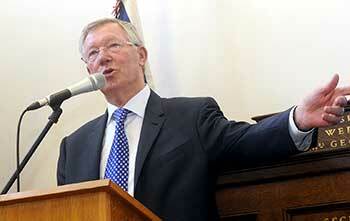 However, Sir Alex Ferguson’s message isn’t only to young people, but also to parents and carers. He underlines the benefits from BB membership and all that he gained from his own childhood experience within the organisation. The Boys’ Brigade is already working with more than 50,000 children and young people and more than 1,400 groups across the UK and Republic of Ireland. 20,000 young people aged five to 18 attend one of the 430 groups every week in Scotland alone. The organisation now wants to welcome new members to come and explore new experiences, make new friends and learn in a fun and safe environment. Bill Stevenson, Director for The BB in Scotland, said: “The BB helps engage people of all ages and walks of life in activities they may never normally experience, welcoming members to become part of our BB extended family. Volunteering is also a fundamental part of the BB, and young people are being encouraged to join to not only help others, but also gain vital experience and skills. Youth Link Scotland, the national agency for youth work, estimates that youth work has made a major difference to the lives of over 450,000 people in Scotland today, over 13% of the Scottish population. The total value of youth work in Scotland also stands at a minimum of £656m, a return of £7 for every £1 of public money. Bill added: “We want to encourage young people to volunteer and discover their inner talents in a place where we actively nurture and offer endless opportunities for everyone. We recognise the high importance of volunteers in our organisation, and hope more people consider joining our supportive network. If you are already a member, get involved on social media, using #MyBBadventure to share your own experiences and tell us what you enjoy most about being in the BB.